IN-spired, the latest performance from Seattle’s Whim W’Him, opened this past Friday, January 22, to a large crowd of enthused “Whimmers,” as artistic director Olivier Wevers refers to his company’s supporters. Those who did not enter the Cornish Playhouse considering themselves Whimmers likely changed their perspective by the close of the show, thanks to a spectacular trio of new works. The evening featured creations from Wevers, Mark Haim, and Dominic Walsh, all showcasing a stellar group of dancers. The first work of the night was Wevers’ own Brahms and Tights, a balletic interpretation of classical music performed in neon sci-fi apparel. Classic canon structures and angular yet graceful bursts of movement allowed each dancer to let their own movement style shine through. Particularly arresting were the fresh spontaneity of Mia Monteabaro, the fluidity of Jim Kent, and the superhero presence of Tory Peil. The synchronicity in the unison sections was always just a touch imperfect, although it didn’t seem to matter in this world that Wevers created. Simply performing the same movement at the same time did not rob the dancers of their individuality of expression. The piece was a beautiful exhibition of dance, though it lacked compositional cohesion. A brilliant moment of connection occurred as the dancers froze into a Renaissance tableau downstage, each dancer occasionally moving to change the scene. The partnering, which was performed outside of the strictly gendered roles of traditional ballet, also stood out. Each lift appeared as anti-gravity as the sci-fi costumes suggested. Haim dedicated Overflow to his immigrant and refugee parents, which showed in the emotional heft it brought forth. It opened on an ethereal Monteabaro, with the stage lights (beautifully designed by Michael Mazzola) creating the illusion of fog. As the other dancers entered, their initial movements floated like fabric on the wind, and gradually evolved into more gesture-based distillations of everyday motions. Regardless of how the dancers moved, a grieving, longing quality permeated Overflow. 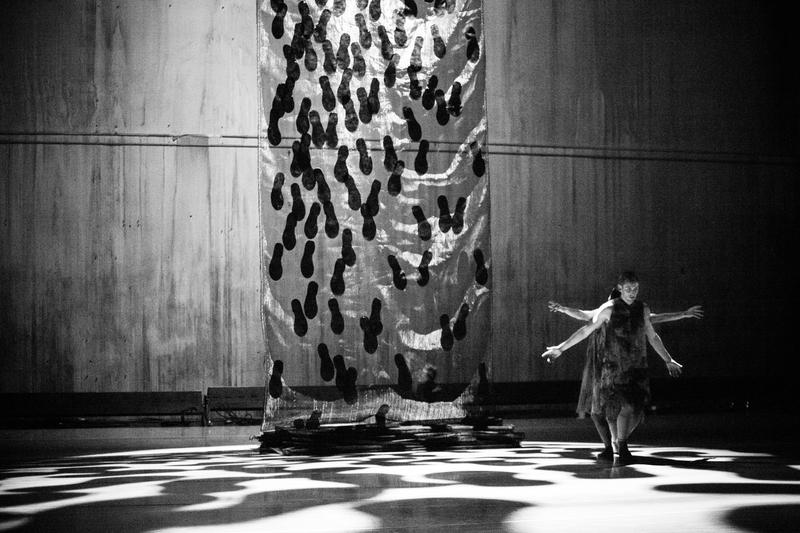 This pathos was reflected in Corrie Befort’s set design: a sheer curtain marked with footprints which slowly lowered from the ceiling for the duration of the work. This neverending curtain became a quiet march of refugees, accumulating in a puddle of cloth throughout the dance. Behind the curtain a dancer carried another on his back, slowly traversing the stage with all of the struggle of Atlas. This heavy mood lifted in the final moments of the piece, through the incredible presence of Kent, who observed the other movers with a palpable openness and attentiveness, allowing them to be seen. The Ghost Behind Me, Walsh’s tale of a puppet master and his subjects was complemented by live original music. The score, composed and performed by Houston-based Two Star Symphony, was beautiful, driving, and haunting. It skirted the edge of circus music without becoming cliché, and the presence of the musicians on stage felt a part of the piece. Within a series of spotlights, the puppet master (Justin Reiter), controlled his dolls in an image as old and familiar as Coppélia. Even more captivating were the dancers crawling and creeping across the floor in the dark spaces between the light. They set the ominous mood for the manipulation the puppet master used on the protagonist, portrayed by Patrick Kilbane. The highlight was a trio in which Kilbane’s character gained some agency, but was tempered by a constant hand of one of the other dancers on him. Walsh’s Ghost was the ethos to Haim’s pathos, and impressive in its detail. However, Haim’s work was affecting in a way that left the other two pieces wanting. The opening night of IN-spired closed to a well-deserved standing ovation. 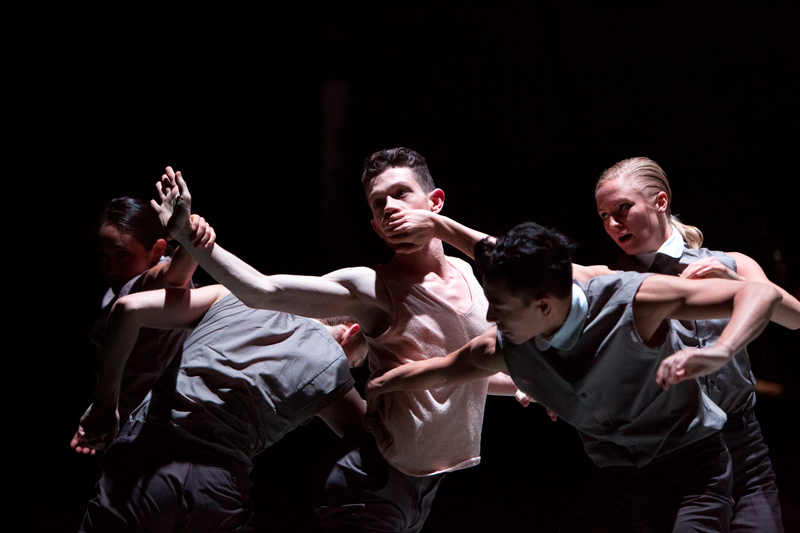 In the arthouse scene that is Seattle modern dance, Whim W’Him is a refreshing treat, becoming a premiere Seattle dance company for its polished contemporary dance. There are still tickets available for this weekend’s performances (January 29-30) through Brown Paper Tickets. Whether a fan of ballet or modern dance, IN-spired is certain to please.